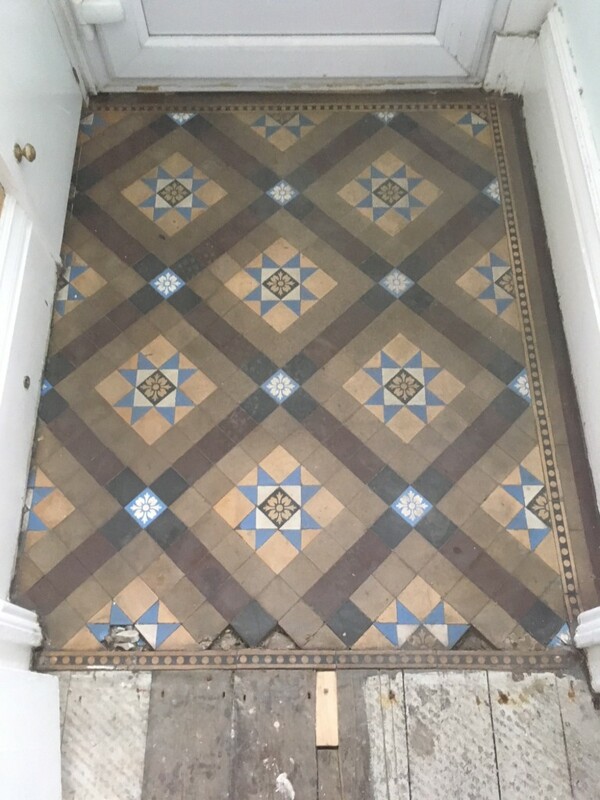 I often get asked to do small jobs as well as large kitchens, conservatories and hallways, and there is something especially satisfying about restoring a small entrance like this lovely Victorian tessellated tile floor. The property was in the historic market town of Kendal just to the south of the Lake District and famous for making Kendal Mint Cake. Being at the entrance to the property the floor had seen some wear over the years and the once beautiful colours in the original tiles had become dull and dreary, and some of the smaller tiles along the edge of the floor had become loose over the years and were now missing. I was asked to repair the damage, clean the floor and restore the colours to their original glory! 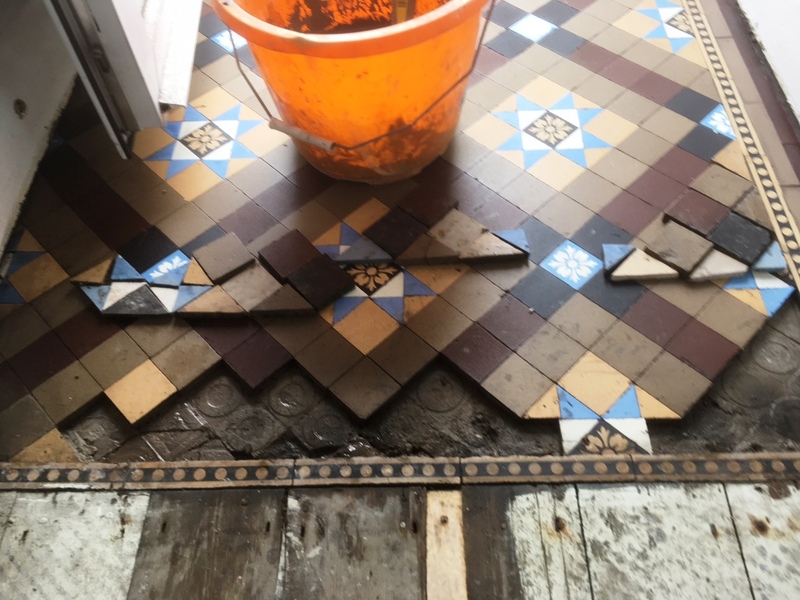 My first task was to thoroughly clean the tiles and given these old Victorian floors have no damp proof membrane I was wary of potential damp problems which can be exacerbated by the excessive use of water. I decided the best approach would be to apply a coarse Tile Doctor 200-Grit Milling Pad fitted to a slow speed Victor burnishing machine. To lubricate the process, I used 500 ml of water and then added a little more as needed. I carefully went over the whole floor, then vacuumed up the excess water which was now saturated with dirt and grime! I then went over the whole floor again, replacing the coarse Milling Pad with a Black scrubbing pad. This is designed to deal with heavily built up grime and dirt. 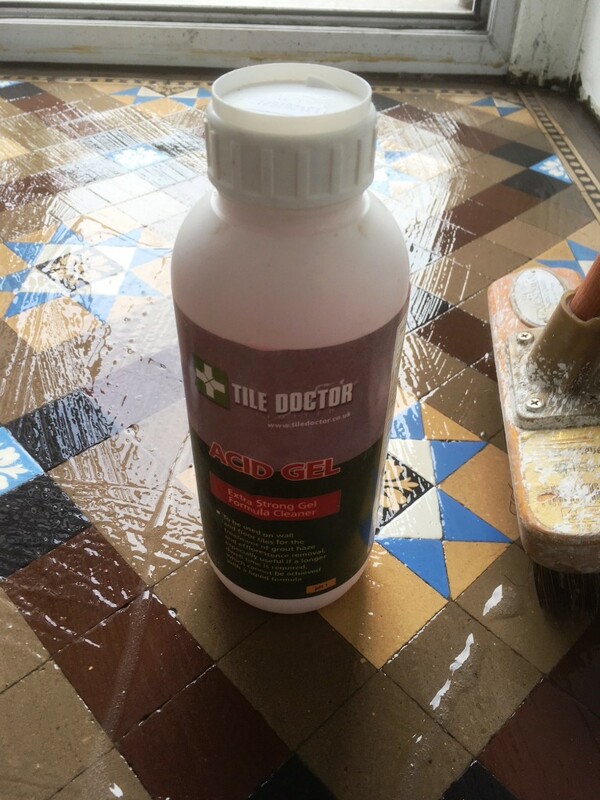 I also applied Tile Doctor Acid Gel, a specially formulated PH1 blend of Phosphoric and Hydrochloric acids. This slow release gel works by breaking down any mineral salt deposits that might have built on tiled surfaces up over the years and removes grout smears. The final stage in this part of the project was to scrub the floor with a deck brush, rinse with water and extract immediately with a wet vacuum to leave the floor as dry as possible. Once the tiles had been deep cleaned I moved on to repairing the floor. Reproduction tessellated tiles in a design like this one can cost anything up to £300+ per square metre, so restoration is nearly always a cost-effective solution. It is, however, a precise process. The original floor would have been laid by highly skilled tilers who had to accurately position each element of the intricate mosaic pattern. The grout lines were also very fine to allow for tiny dimensional differences without spoiling the beautiful pattern. Sometimes new tiles can be a shade lighter or darker than the original tiles which are usually well over 100 years old! I always explain this to customers before taking on a job like this because sometimes it is just not possible to find an acceptable match and it is then the customer’s choice whether or not to go ahead. In this case, luckily, I was able to find replacement tiles that were going to work, so I took out all the damaged tiles and carefully replaced them with new ones. The last stage for that day was to carefully grout the restored areas to secure the tiles and then clean off the excess grout haze. I left the floor over night to dry out completely. The next day I checked the floor for damp with a damp meter as too much moisture in the floor can affect the sealer. All was well, so I sealed the now clean and restored floor with Tile Doctor Colour Grow which is a colour intensifying sealer that brings out the amazing colours in the tiles. The sealer will provide durable surface protection and Colour Grow is what we call a breathable sealer that will allows any damp or mineral salts to rise up through the tile. The acid wash we gave the floor during cleaning should counter any efflorescence salt issues however if they do appear they can be easily washed off with clean water. This may have been a small vestibule, but the restored floor now makes a real statement as you enter the customer’s house! 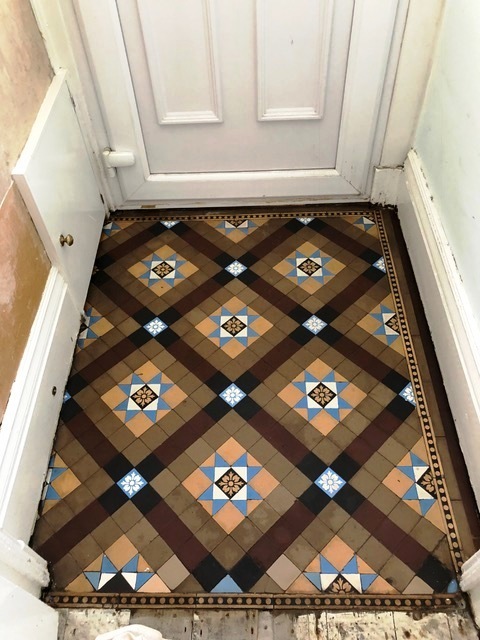 This entry was posted in Victorian Posts and tagged Cumbria, Kendal, Kendal Mint Cake, Lake District, Tessellated tile floor, tile floor cleaning, tile floor colour restoration, tile floor restoration, Victorian tile floor by AbzDominise. Bookmark the permalink. Covering South Cumbria Heidi Taylor is an agent of Tile Doctor, the largest Tile, Stone and Grout restorative cleaning network in the UK who have developed the products and techniques to handle a multitude of issues surrounding tile, stone and grout restoration.